Seeing as I don’t have any stitching to post, I thought I’d take up Kim’s challenge and post a piccie of my current favourite mugs. The sunflower one is a china one and I use it for my teas, and I usually use the cat one for my coffee and milo, ‘cos it’s quite huge. Unfortunately my absolutely favourite pair of mugs got broken by Andrew and Fraze in the last flat … I requested that Fraze buy me one for Christmas, which would have been a nice cheap gift, but I guess I’ll get around to ordering them again myself one day. It was a beautiful hand-made pottery mug made by a potter in Coffs Harbour, Queensland, and was the perfect size, perfect shape, and perfect colour – blue with a purply tinge towards the top … The cat one I have now was just a cheap one on sale to use until I replaced those hand-made ones, but I’ve ended up loving drinking from it – the shape and size is great 🙂 Those are the coasters that I use as well – they’re glass with turquoise stripes on them … I adore turquoise! Well, my first guests arrive today – I ended up spending all my time last night rearranging the lounge furniture, as I came home from work to my missing lounge chair sitting outside the front door, much to my surprise, as I had no prior notice that it was coming until it had arrived! … so this morning I am up very early to get all the things done that I had planned to do last night, before they arrive. I feel pretty exhausted, but at least I was so exhausted last night, I slept for 9 1/2 hours solidly, which is the first time in over a week – yippee! Better enjoy it while I can, as I’m coming up to 5am starts this week … groan. Don’t know if I’ll get any stitching done this week while H & P are staying here – I really hope so, though … I think I need some good stitching time to restore my state of peace, as I’m feeling a bit ragged! So glad you had a good night’s sleep! Have fun with your friends and slip in a little stitching if you can. Thank you for your very kind comment. From what I’ve read, you are a very emphatic, sweet person and I am happy to know of you. Hi Anne, I love the cat mug and those glass coasters, the turquoise is stunning…….. thanks for your comment, too, it has been quite a week, with all the visitors. I hope all goes well with your visitors and the early starts. 5am sounds hideous, I don’t know how you do it. Good luck keeping up with everything and staying reasonably well rested! I’m a little behind on my comments… Love your two mugs! 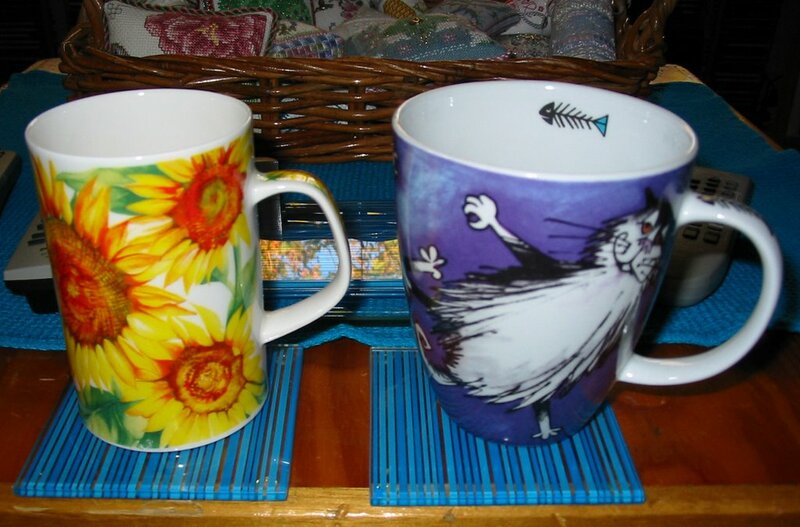 The sunflowers are so bright and pretty, and the blue cat mug is great! I love your cat mug, hope you manage to find some stitching time this week. I love the mug! 🙂 Hope you have a good time with your company. Anne, I hope you have a great time with your company even if you don’t get much stitching time in! Just LOVE your cat mug – and I will post pics of my favs too – soon! Know how you are feeling too Anne, I too am pretty frazzled with all that has gone on over the last couple of weeks and have not picked up a needle in over two weeks. I will change that this afternoon – although I might go and plant out some pts as it is a lovely day here.